At the UX Book Club San Diego meetup last night, we got on the topic of how humor in website copy seems to make websites and interfaces more relatable to its users. One of the group's co-founders, Brie Ann Demkiw, mentioned how she has noticed using one line of humor in a string of text helps increase conversion rates and can increase user loyalty. Google started doing this a few years back with Google reader. Their message read "Oops! That wasn't supposed to happen." Even Firefox has started incorporating this tactic. 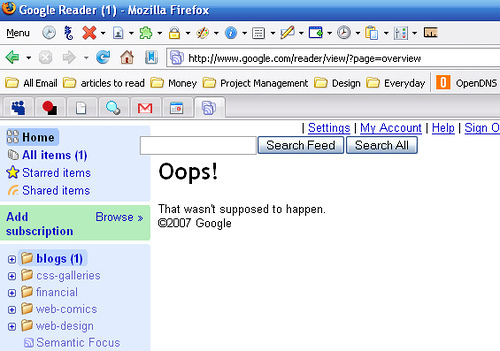 When Firefox asks if you want to restore your browser session after crashing, it reads "Well, this is embarassing." I think it's 100% true. When I read a funny error message or sarcastic instructions in place of something standard and ordinary, not only do I get a chuckle out of it, but I am more emotionally drawn into those sites or applications (in a subconscious way), because of the humor used. Why is this? I'm no human behavior expert, but it seems to me like humor is more relatable and shows that there is a real person with real emotions/personality who wrote that particular error message. When we read a standard, boring old string of text that's been used on a million other websites, we aren't phased by it because it's "the norm" and is just the standard way of presenting information. Humor is different and people respond differently, whether they know it or not. So, to interface designers: go out and be funny. Do something out of the ordinary that users will remember. Although it might be cheesy or sound lame to your boss or clients, it just might have a profound effect on the users, without them even realizing it. I am an extremely careful people when it comes to using my credit card. I'm fully aware of tactics that fraudsters use to capture card numbers, so I keep my eyes open and try to be extra careful. So when I got a call from Citibank, telling me my physical card had been used in Spain this morning with a "travel agency" for $1075, I was pretty surprised, considering I haven't been to Spain for a few years. Now I get to tear my hair out to try to figure out where exactly my card might have been compromised. I recently went to San Francisco. Maybe at the BART terminal where I got my BART pass? But I checked the card reader against other card readers at the station. Maybe they were all bugged? It's really the only place I used my card recently that wasn't online or at a restaurant that I frequent. I used to scoff at people who had their cards compromised. "How dumb can they be?" I thought. It just goes to show that no matter how careful you are, credit card fraud really can happen to anyone who uses plastic, even occasionally like me. Thanks to Citibank for looking out, and for calling my cell as soon as they thought something was up. Now if I can just get them to NOT deny my charges at Fashion Island (where I shop frequently), so I don't have to call them to authorize another compulsive purchase and look like an idiot in front of fellow shoppers.